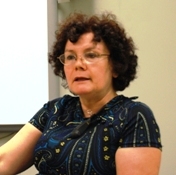 Valerie Gonzalez works at the Institute for the Study of Islamic civilization of the Aga Khan University in London. She is about to publish the book “Aesthetic Hybridity in Mughal Painting” for Ashgate Publishers, which reveals the strong Islamic influence in the paintings of Mughal, India. Valerie attended the workshop on “Strings, supersymmetry and gauge theories,” held at Stony Brook, where she told an attentive audience of string theorists and mathematicians about the close relationship between geometric abstraction and sacred art in the Islamic world. The finely engraved images of medieval domes resemble the “geometric tilings” constructed to explain certain phenomena of string theory. According to common lore it is forbidden to have figurative art in the islamic world. Is it really true, if yes what is the reason for that and what is the historic origin? This is a misleading cliche. In the Qur’an, considered literally God’s speech, it is forbidden to worship idols that are images of gods and more broadly representations of the divine. In this sense, figurative representation of God is prohibited in Islam. By extension, there are no figurative representations of living creatures associated with a religious narrative in mosques or any other building of religious function in Islam. However, this doctrinal view and the risk of idolatry inherent to the use of figurative imagery engendered an attitude of suspicion toward images in general. This attitude is reflected in the texts called “Hadith”, the collection of the Prophet Muhammad’s deeds and sayings that forms the Tradition (Sunna), a model of Islamic ethics. Some of these Hadith are clearly prohibitive regarding images beyond the specific restriction applied to the figuration of the divine. While remaining normative, these hadith were not followed to the letter and figurative representation did flourish in Islam within a certain framework, mainly objects and books. Ultimately, this general attitude led to the remarkable development of abstract modes of visual expression such as geometrical design, ornamentation and calligraphy. How did this tradition evolve in time? The problematic of figurative representation was diversely approached within the Muslim world depending on many parameters such as the historical period, the politico-religious nature of the regime or the dynasty and the geographical-cultural area. This is a very complex issue that cannot be dealt with in a single paper. However, two main aesthetic patterns of evolution can be detected. The first one is that initially figuration was not the object of intensive creative research. As a result, many local pre-Islamic traditions of representation were appropriated and maintained throughout the ages. The second pattern is that figuration was confined to certain types of media and, mainly, but not exclusively, to the secular or profane sphere. A rich and specific culture of images blossomed in the world of Islam, in the particular realm of portable objects, mainly ceramics and painted book and albums (albums of paintings and calligraphies). The small scale of this imagery and its association with texts or writings can be pointed out as particular features of figuration in the Islamic world. Some of these images do represent religious scenes involving the life of Prophet Muhammad, including his portrait, and biblical stories as well. In times of doctrinal stiffness and iconoclastic tendency, these representations could be altered in order to become “disembodied”. For example, figures’ face could be erased or a line could be drawn at the level of their neck in a gesture of symbolic decapitation. 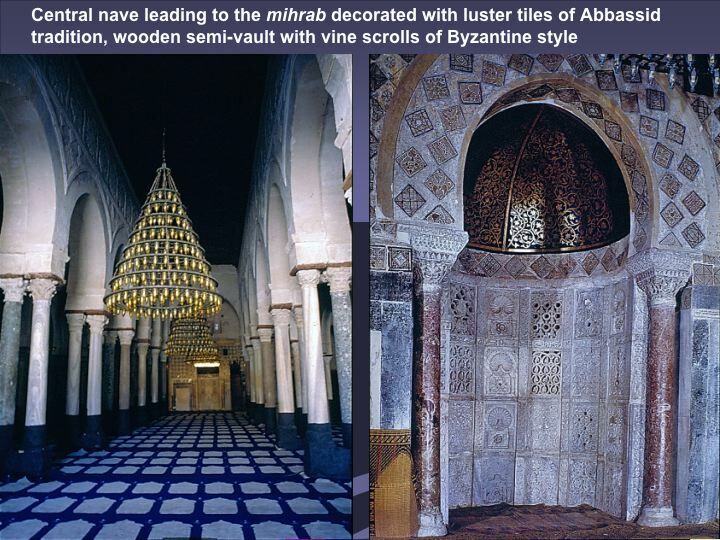 What are the consequences for the islamic art? What are the similarities and differences with christian art? Basically, the consequences of these cultural features in the art of Islam can be summarized as follows: a remarkable creativity in abstract artistic modes and visual cognitive systems such as geometry, calligraphy and ornament; the creation of alternatives to objective representation such as artistic features suggesting mental images and figurative associations taking place in the beholder’s mind; a great art of painting in books and album pages that did develop in the Arab world but found its greatest achievements in the Persian world and the cultural zones under Persian influence (Central Asia and India). If I had to point out one difference to compare and contrast the art in Islam and Christianity, this difference would be the reference to the human body to support the metaphysical narrative relying itself on an ontology of mankind and the divine culturally determined. The divine is incarnated in human form in Christianity, whereas Islam maintains a separation between the human and the world of forms and God that is an absolute abstract entity. The arts naturally translate in visual terms these different ontological conceptions so that in Christianity the human body is the matrix through which the world is represented, whereas in Islam it is not. Since there exist founding aesthetic and philosophical differences between the two arts, the similarities between them are fundamentally of technical nature. 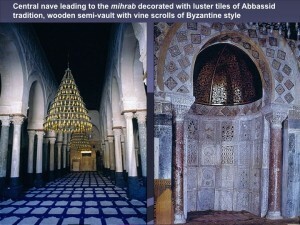 For example, many architectural motifs or patterns of ornament in Islam can be traced back to their Christian source. This Christian source indicates a historical commonality between Islam and Christianity while at the same time it reveals their cultural differences. 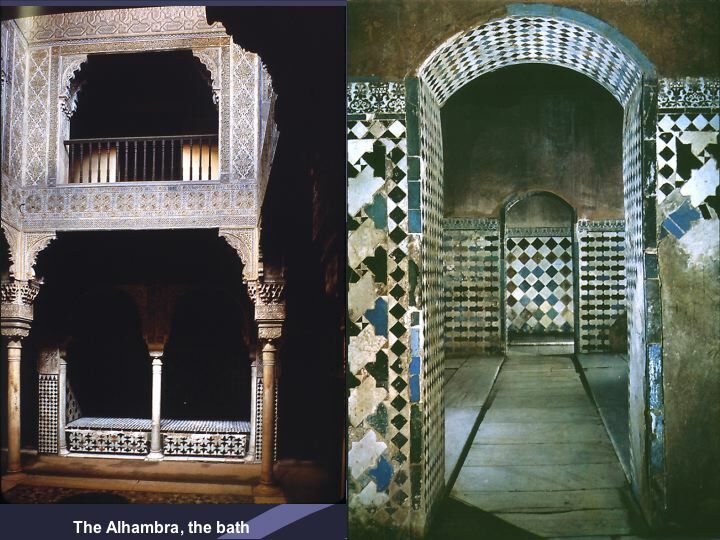 For within the Islamic artistic configuration the Christian element would loose its original meaning to become something else fulfilling a new aesthetic function. What kind of geometry has been exploited in islamic art? In Islam, geometry has exhausted all possible artistic applications. Geometry has served the shaping of spaces, design and decoration in using its mathematical systems without restriction other than the technical impossibility. 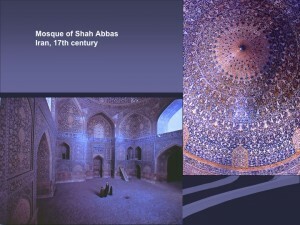 In Islamic art, geometry constitutes both the means and the objective of art making. Geometry serves geometrical art per se; it is an artistic goal in itself. All visual powers of geometrical abstraction were exploited and explored, including the power of producing mental images or the faculty to represent in concrete (but not representational) graspable terms abstract concepts such as the concept of infinity. From the middle age islamic philosophy there is a connection geometry=order=truth=divine perfection, how is that expressed in the art language? In this text, the authors underline the two dimensions of geometry, the theoretical and practical dimensions, knowledge and techne, what Michel Serres, the French philosopher of sciences terms “this theoretical-concrete spectacle” of geometry (in his book entitled “The Origins of Geometry”). More significantly, the Ikhwan al-Safa’ associate geometrical knowledge with art. Here however, art must be understood in the broader medieval sense, as it signifies altogether a wide range of fields and activities requiring creative skills such as every kind of manufacture, handcrafts, masonry, engineering, including of course more specifically artistic practices. Essential though is the view that artistic works supply the appropriate medium in which both theoretical and visual properties of geometry fully operate. These authors considered geometry not only a pure mathematical exercise, but also a source for imaginative activity, a receptacle of values and a mode of aesthetic expression that transforms forms, spaces and surfaces into artifacts producing both beauty and knowledge. Thus understood as polyvalent activity and organizing principle, geometry in Islam served the construct of a geometrical conception of the world that rests upon the conjunction of two powerful founding systems, monotheism and the rigorous sciences. As both theory and practice, or ideality and reality in phenomenological terms, geometry realizes the union between the two opposed spheres of the abstract ideal of mathematical thought and the concrete reality of matter that this mathematical thought enables to rationalize, measure and define. Very importantly then, geometry allows the realities of physics to interplay with the idealities of metaphysics. 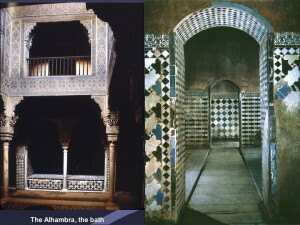 From the viewpoint of Islamic strict and abstract monotheism that forbids any association of God with any form whatsoever, this means that geometry constitutes a licit way to connect up the earthly world of human reality with divine transcendence, without resorting to figurative representation or incarnation of any kind. Geometry allows grasp the constitutive laws of Nature and of the cosmos created by God. Therefore it counts among the signs perceptible in the material world, “ayat” in Arabic, that God sent to mankind as a proof of his existence. And he is the Mighty, the Forgiving! Repeat the gaze: seest thou a single flaw? This very Quranic quotation appears in the epigraphic decoration of the Hall of the Ambassadors in the Alhambra (14th century), in Granada, Spain. Besides the fact that they are numbered, the Islamic heavens display a perfect isotropy and an ordered organization from the bottom to the top. According to the tradition, the throne of God stands in the superior one. The perfection of the universal structure manifest in geometrical perfection and underscored in the Holy text is considered a reflection of God’s perfection itself, a view which is not far from Platonic metaphysics. In this sense, geometry is both a corporeal and conceptual truth. In other words the accessible geometrical truth reflects the inaccessible divine truth. It designs a path that from the earthly truths of physics leads toward the metaphysical truth of the divine while respecting the necessity of keeping the divine essence absolutely abstract, without any formal intermediary between the human and God. By virtue of this philosophical foundation of geometry, in the world of Islam like in that of the Greeks, the highly valued principle of geometrical perfection led to the shaping of aesthetic models applied to architecture and artistic creation in general. However, for the Greeks and the traditions constructed upon their legacy, geometry was the means for realizing a goal which was representation, namely the figurative representation of the Gods, the human beings and everything visible on earth. For the Muslims geometry became both the means and the goal, something which is called generically in art critical terms a non-figural or non-objective representational mode, or more simply “geometrical abstraction”. Animated calligraphy is a type of writing whose letters displays anthropomorphic or sometimes zoomorphic patterns at their tops. Because the characters’ morphology somehow refers to the human figure, even though in an extremely stylized form, they are coined “animated”. My current research is about “Aesthetic Hybridity in Mughal Painting”, a book to be published by Ashgate Publishers.